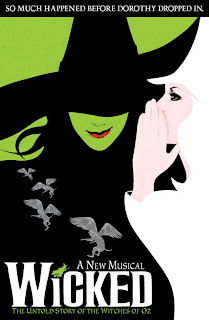 I am really excited for Wicked to finally come to Utah. I've been wanting to see the musical which is based on Gregory Maguire's novel for such a long time. Soon, it will be in Utah at Capitol Theatre. I'm overly excited now, because my mom and dad just went to see Wicked in New York and loved it. Only about eight more months...seems like such a long time. But I'm sure it's well worth the wait. Sorry to break it to you Tash, but its already SOLD OUT! Cora looked at trying to get tickets and i guess they went on sale awhile ago, and they're gone! SAD i know! We should just plan a time and drive to Hollywood and see it! I saw it there and the theater its self is amazing! It is sad but true that it's sold out. We have been watching and waiting ourselves for two years now. You can buy tickets on KSL.com but they are a arm and a leg. You could probably fly to New York or LA and see it for way cheaper and that's including airfare. It's well worth seeing, but not sure for $300.00. I'd like to know when the tickets actually went on sale.